Which church should you go to? If you're both already attending the same church, than this would likely be a non-issue. But the problem arises if you attend different churches. In some situations, the solution is simple. If one of you attends a church that teaches the Bible while the other attends the church that teaches heresy, then you should probably attend the Bible one. Or if one of you is a member of your church while the other is a visitor of theirs, then it makes sense to attend the member's church. Or if one of you loves your community while the other isn't fond of theirs, maybe attend the church that's loved. But what do you do if both of you attend relatively solid, biblical churches? What if you're both committed members of your church? What if you both love your community and want the other person to join your church? If you're a Christian couple and this is your situation, whose church should you go to? It seems like the logical answer to this problem would be to simply go to the better church. But the problem is that this is often difficult to gauge. I mean, how do you determine whose church is better? You may compare the size and judge off that, but is size really the best way to determine a church's spiritual health? You may compare the quality of the preaching and teaching, but won't you both likely prefer your own pastor's preaching style? You may look at the strength of the community, but how is this not subjective? So usually what couples do is attend each other's churches for a time and see what the Sunday worship is like. However, the problem with this approach is that each person will inevitably play the comparison game and end up noticing all the shortcomings of the other person's church. That's because deep down, you really want your significant other to notice the beauty of your own church. So while each person will say they're going to each other's Sunday service with an open mind, they can't help but be biased in their assessment. What makes this more problematic is that if you're in this situation, you don't really have many people you can turn to for help. That's because in situations like this, you would usually ask your pastor or church friends on what you should do. But your pastor and church friends can't help but be biased. I mean, they don't want to see you leave. But the problem is your partner is likely meeting with his/her pastor and church friends and is receiving the same advice. Personally, I don't think there's a clean-cut answer to this. As I mentioned above, there are some scenarios that make it a little more clear on which church you should attend (ex: heretical church vs. biblical church). But of course, scenarios like this are almost never as simple as we'd want them to be. So if all things are fairly equal , what should a couple do? Well, this may not be the most popular solution today, but I think the answer is simple: attend the guy's church. Why so? Well, if you're an egalitarian who's appalled by gender roles and believes male leadership in a marriage is simply archaic vestiges from Old Testament patriarchal times, then nothing I'm about to say will make sense and we need to have a different conversation. But if you're a complementarian and believe husbands are called to be the spiritual leader of the household (Eph 5:23) and wives are called to (gulp) submit to their husbands (Eph 5:22), then I can't help but encourage women to attend their husband's church. I know, I know. This all sounds so primitive and old-fashioned, right? I mean, just because he's a guy, the girl should follow him to his church? And I know, a lot of girls probably think, "But his church just isn't as good as mine." Maybe it's not. 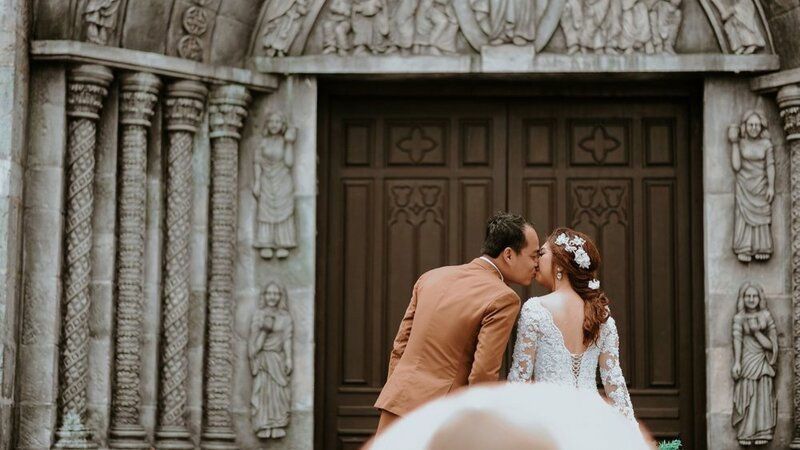 This decision doesn't necessarily mean you're choosing the "better church" - but I think this decision means you'll be choosing a better marriage. I know this isn't easy for some people to hear. The thought of leaving your church for your husband's church is probably really painful. So why do I say this? Well first of all, nothing will likely shape your spiritual lives more than the church you attend (Eph 2:18-22). That's because it's in the church that you will receive preaching, ordinances, and fellowship. And if you believe that your husband is supposed to be the spiritual leader of your marriage, then I can't help but think God wants you to trust him on this major spiritual decision. But in my opinion, if a couple disagrees on which church to go to and ultimately decide to go to the wife's church, I wonder how he's spiritually leading her. I mean, who's following who? Guys will rationalize this by saying, "I'm sacrificially loving my wife as Christ loved the church." But in my eyes, the poor dude is getting spiritually neutered here. That's because it seems like she's shaping his spiritual life a little more than he's shaping hers. Yes, he may be loving her. But man, he's not really leading her. Secondly, if the husband is going to be the spiritual leader of the household, I feel like the burden should be on him to introduce, integrate, and accommodate his spouse into a spiritual community. I mean, have you ever brought a friend to church who was resistant to getting plugged in? It's not easy. You need to always hover around them, coddle them, and encourage them to go to church events. It's a burden integrating anyone new to your church, but you make this sacrifice out of love for your friend. Well if you're married and your spouse agrees to attend your church, it's not going to be easy plugging them in. They'll naturally be resistant because it's a new, uncomfortable situation and they can't help but compare your church to their old one. In fact, there will be this constant pressure of making sure your spouse is ok. So while you may be happy that you "won" the church battle, you now have this responsibility to make sure your spouse is happy too. But shouldn't the leader of the relationship bear this burden? Lastly, if the husband is meant to be the spiritual leader but he follows his wife into her church community, I can't help but think this sets a bad precedence for future decisions. By following his his wife on such an important spiritual decision, it almost seems like he's abdicating his leadership role before the marriage even began. And if the wife doesn't respect and trust her husband on one of the most important spiritual decisions that they need to make, then how will this affect her respect and trust in his future spiritual decisions? Again, if you're an egalitarian, then all of this will sound like chauvinistic nonsense. "What's wrong with him following her?" I know, I get it. But as unqualified as most husbands are, I truly believe the Bible calls them to carry the responsibility to spiritually lead their wives as Christ leads His church. More specifically, husbands are the ones called to "sanctify her" and "cleanse her by the washing of water with the word" (Eph 5:25). But I'm not sure if husbands are off to a good start when he caves in to her preferences and follows his wife to her church. By no means am I saying what I wrote is always the case. I'm aware that there's probably that one special couple you know where the guy went to his wife's church and now he's a leader and elder at that church. But I think those are more the exceptions than the norm. In fact, from my personal experience, most couples I know where the guys follow their wives to her church often end up leaving to find a more "neutral" church community. I'm not 100% sure why this is, but my guess would be the reasons I mentioned above. And lastly, I'm not saying a girl should just mindlessly follow a guy to his church. In fact, I think it's pretty cool that she takes her faith and church serious enough to challenge her potential husband on what their future spiritual community will look like. So by all means, girls should share their thoughts and concerns and have their husbands convince them on why his church is better for them as a couple. Just having this type of dialogue is sanctifying them. So listen to each other's pastor's on podcast and visit each other's churches. Discuss your church's theology and ministries and community. But if it's pretty close, go to his church. This is what I would advise any Christian couple - even if the girl attended my church. Why? Well, I'd tell her to trust the spiritual leadership God has assigned to him. After all, if you don't trust it now, then what makes you think you'll trust it later? When Should Christians See a Professional Counselor?